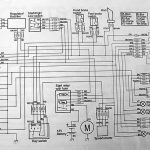 This electrical information is for Husaberg motorcycles. 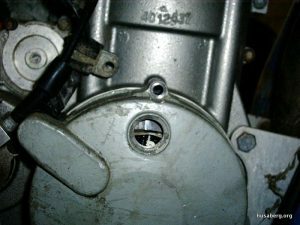 We start with a look at the later Kokusan Ignition system, and then move back in time to SEM ignition motorcycles, which were on motorcycles up to 2003. 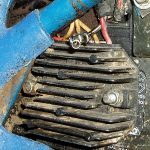 For additional information and questions about the Husaberg electrical system, check out the dedicated Husaberg Electrical forum. It’s very unusual to have problems with this system, recheck the soldered joints on the stator, 2004 stators were prone for desoldering, but usually on the alternator side. Check the resistance between Red/White and Black/Red should be around 15 Ohms. Check the secondary resistance of the HT coil with out the cap around 5000 to 6000 Ohms, put you meter setting on 20K, then test between the HT lead on earth, this should give you the secondary resistance. Check the Blue feed wire to the coil and all other connections. Also check the main bunch of Brown earth wires that are near to where the Blue coil feed is. There are no tests you can do on the CDI (Sparks). 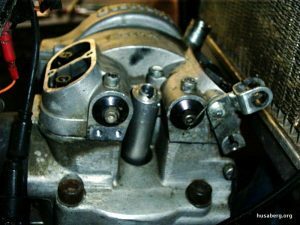 To reset the TPS on the Keihen carb, the engine has to be idling at manufacture’s spec – 1,800 RPM. Disconnect the plug from the TPS measure the resistance across blue and black wires it should be 750 Ohms + – 25 Ohms at 20°C or 68°F. (Sparks). There are two readings to be taken, the first is often close to 750 but it’s been found to be nearer 1100-1200 instead of 750 at the second (DaleEO). Hribman has done it! Follow his conversion from SEM to Kokusan ignition. 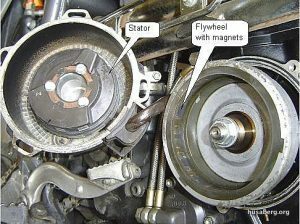 The stator contains two sets of coils – the trigger coil and the magneto charge coils. The charge coils put out about 10 AC cycles per engine revolution at 200VAC and this is fed to the CDI/coil unit under the tank. In this unit there is a rectifier which points all the AC pulses in the same direction to make DC at about 300V. This DC is fed across a capacitor of about 1 microfarad which stores the charge like a tiny battery. 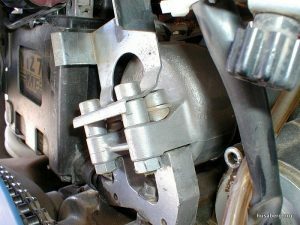 When the crank gets to a pre-detemined position (set by “timing” the engine) the trigger coil puts out its only pulse per revolution at up to about 20V to the CDI unit. 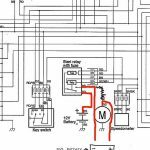 In the CDI there is an analogue timing circuit (note; it is rarely a microprocessor in magneto systems) that puts out the signal to fire the plug a time (ie number of engine degrees) after the trigger coil fires. The change in lag time of the timer is what gives the spark advance curve. The amount of time this lag happens (ie the function or “curve” of engine speed versus spark timing) is dependent on engine speed and the electronics in the timer circuit. I imagine that different CDI units could have different spark timing curves. You would probably want different spark curves between the 400cc and the 600CC bikes of the same year. Some models of bike have a switch on the handlebar which gives you the option of two different spark curves. Anyway, when the timer puts out the signal to spark, it triggers (or switches on really really fast) a Silicon Controlled Rectifier (SCR) to dump the entire 300V stored in the capacitor through the primary winding of the ignition coil. 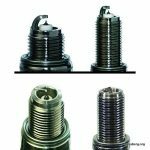 This causes a very fast rise: a 30,000V spike in the secondary winding which goes straight to the spark plug to create the spark. 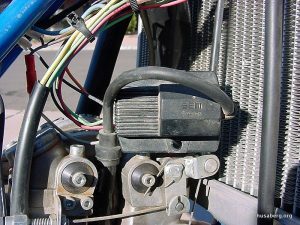 Early (small coil) SEM ignition systems were analogue. 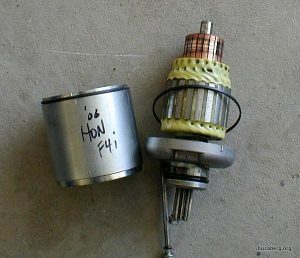 The ignition curve was simply a product of rpm. Increase rpm and the trigger signal is generated earlier and consequently: “ignition advance”. Second generation SEM systems (i.e. Digital Force) had two independent curves based entirely upon engine rpm and handlebar switch location. SEM solid state hardware be it digital and / or analogue is contained in the coil housing. RPM dependent capacitor charge voltage generated by the ignition charge winding located in the stator (usually between 30 and 300 volts DC) is stored in the coil housing capacitor. 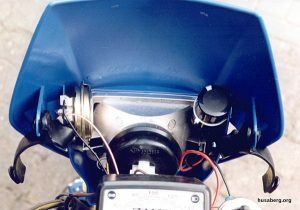 A thyristor awaits a pre determined voltage signal from the ignition trigger winding also located in the stator. 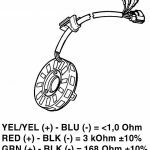 Once minimum trigger voltage is met the thyristor releases the stored capacitor charge via the ignition coil primary windings. Said charge is stepped up to 30K volts (plus/minus) via the ignition coil secondary windings. If only we could guarantee this for you! In the meantime though, here are some hints! There are many things to try, another one is the Taff’s Crescent Mod on the kickstart mechanism. This gives a longer kick. Despite the service book recommending a new cap regularly, few owners bother yet often struggle to start their machines… say no more! Silicon both ends of the HT lead where both sleeves go over either the cap or plug. The YTZ7S batteries are 6 amp with cold crank of 130, the original YTX5L-BS is 4 amp with a cold crank of 70 (yoshie). Use an Optimate battery charger (see handy tools) to keep the battery topped up between rides. All kinds of prices are banded about, but have a look at this thread for the pitfalls of the conversion. The YTZ7S is a Gel-Cel battery and is nearly the same size as the YTX5L-BS. It’s actually about 3mm wider so to fit it, break the poorly welded tray the battery fits into at the joins. The CTZ battery is an AGM (absorbent glass fiber matting) battery and is allegedly better still than the YTZ with 160CCA. See here for a view on both. For 2003, a second earth was fitted from the battery earthing to the frame. This is a back cure for SEM’s, and not a forward cure for the 2004 models onwards. The wire feeds straight from the charging coils and carries a fair bit of voltage, as Bundy found out. Miles of wiring can be removed including the ugly wiring down near the starter relay and battery. There is a lack of lugs around the headstock from which to support the wiring harness, so use extra large cable ties for support. Hours can be spent re-routing the wiring harness for a good clear run but it is worth the effort as good wiring also looks better. Gets covered in mud. At a stretch and with an extension to the wiring, it can be moved to under the seat and relocated to the central bolt, this was standard for the last SEM year (2003). This can be done when they become faulty or get knocked about in a fall. Using the ‘dead stop’ method, I found the flywheel marks to be out. It changed the bike! Mark the new scratch with say – tipp-ex and now you’re ready to strobe the engine. 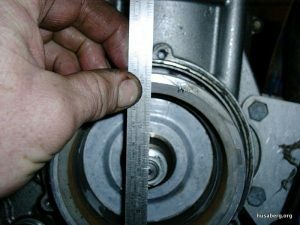 Remove the protractor and now use a ruler and a scriber to mark the flywheel in a line toward the center of the crank. Mark a scratch across the top of the flywheel with a pencil or whatever temporarily. …and then turn the engine gently till it touches the ‘dead-stop’ the other way. Adjust the protractor until the numbers read the same ‘before’ and ‘after’. Your ‘0’ is now the real TDC. 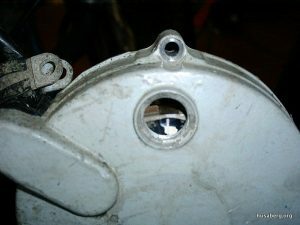 You can see the original pair of lines through the sight hole on the ignition flywheel. The one on the left is the original TDC, the one on the right is the original 5d BTDC. You are going to have a new line to the right of this pair – equidistant away probably. Forget the white blob by the owner, you can see the deep groove has been painted white. This is your timing mark on the stator. Move the old TDC marks down to BDC and fit the ‘dead-stop’ tool and also a screw with a pinch nut and a little pointer in the direction of the center of the crank. This is an alloy tube, threaded at the end with a hollow center for a steel pin. The steel pin sticks out about 30mm into the chamber and has a domed tip to avoid damaging the piston. A pinch screw to keep the steel pin still can just be seen to the right. Use a strobe with a timing adjustment knob. 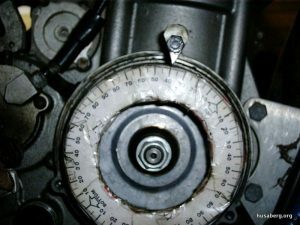 Set the timing so that the line on the flywheel meets the mark in the spy-hole using the adjustment knob. Half this figure is your advance (i.e. 72° that means it is 36° advanced) (Lineaweaver). 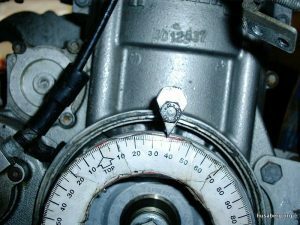 Read more about ignition timing using a strobe. Rub them over with Scotch-Brite/scouring pad, then dry before connecting with a splurge of silicon in. This is very easy and takes just an hour. 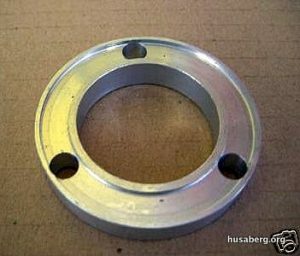 Buy an alloy bung from your Husaberg dealer to fill the hole left by the starter when you remove it and the solenoid. 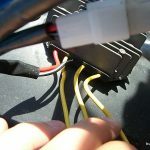 Disconnect the two leads, remove the battery and all mounts etc, disconnect the solenoid wires and that is it! Despite the rumors, the bike will still stop on the kill switch or ignition key. Here’s how to run your Husaberg without a battery. This can always be a problem but it was mainly with the SEM ignition bikes that we struggled. Things were ‘beefed’ up for 2003, the last SEM year. This is some number crunching and stats. Read more about difficulties starting your Husaberg. Check out Poor Starting or Engine Upgrades for more details. There’s no need to get an Acerbis. The 2006 rear tail assembly will fit straight on. The OEM is the only headlight that has the correct “cut-off” for your side of the road. All aftermarkets headlights have a flat low beam. Some recommended quality spark plugs are the Nippon’s Iridium IXU24 and NGK DCPR8EVX, which have been tested by the Husaberg community. I went with the IXU24 and it really helped the motorcycle to start. A well carbureted motorcycle which might be correctly (read: leaner than delivered but still CORRECT!) will see one of these expensive spark plugs last 3-4 years plus of racing, trailing etc. 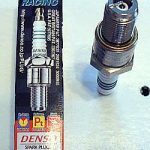 OEM jetting is generally on the rich side and so a fresh plug every year to be safe wouldn’t go amiss as the OEM mixture of rich starting and heat in the upper revs really kills plugs. 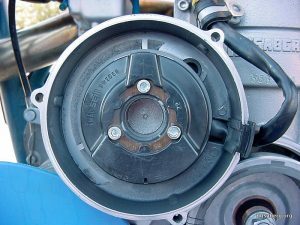 Ignition Cover – Defeat Water Ingestion! 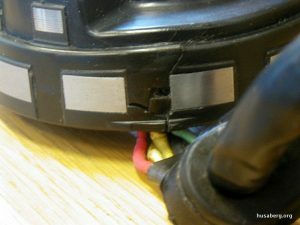 Wiring tube splits-plastic is brittle so the tube should be replaced, the wires can be fed through one at a time using some welding rod a s a ‘rodder’ or lockwire. 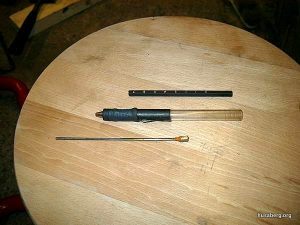 “Shepherds crook” the tube over to stop water entering and silicon and zip tie both ends. Feed the cable around the back of starter motor or close to the oil filter. To stop getting moisture in: silicon the side cover on and then don’t remove. Also, drill a hole in crankcase from underneath, this should be 6mm OD and done at the back of the flywheel housing. This will help it self-dry. I used to fit loose split pin to keep the hole ‘clear’ but it’s not necessary and the hole is never bunged up! A running engine will push the water out if it ever got in. 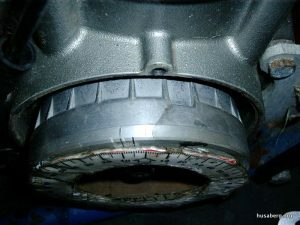 Cover the stator and flywheel weights in petroleum jelly, this stops rust. Change to a “staple” type fuse as the clip in type come loose and blow a fuse. A tremendous in-depth look on this thread with great input from Bundybear. It’s possible to run the bike without the battery and all is easy to remove. 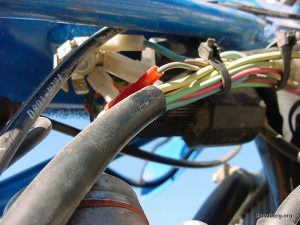 Remember to disconnect the orange wire at the cdi/coil if the ignition system is ok then it should produce a spark (Sparks). Split open in red. Replace with 2003+ plasticoated clear wiring. All 2006 Husaberg motorcycles now have the facility to fit a fan so all parts to do the job ‘dead proper’ will now be available, however we used to bodge it ourselves! And this fan kit is cool! When flicking the switch with the strobe working, you can see the flywheel visibly at a totally different point at tick-over. I dyno’d the two settings and despite the brochure blurb that the difference was only at low revs, i can report that in LO I gained at the bottom and lost at the top: the opposite of the HI position. The Husaberg STATOR is a Greek Epic of Colossal Proportions! No spark. Stators can lose varnish, go rusty, split and crack open and finally die sometimes. You’re lucky or you’re not! I had my first for 4-years and only changed the flywheel, the stator lasted 4 1/2. It’s heat related (Lineaweaver). Check out this discussion on stators. For SEM ignitions: Replace the SEM no more! Is as follows: yellow into a double red (1 into a 2), second yellow into a red/white or can go straight to the regulator (a finned alloy box) which has the wire coding marked on the back, light blue into a brown or to the earth carousel, red to red, black into black and green into green. Your stator can be repaired at reasonable cost by someone who repairs them! Carbonone ordered the KTM part number 580.31.002.050 from his local dealer for $160 and it fitted straight in with no modification. This is the part # for a KTM LC4 and will work on all 1998 and prior bikes. 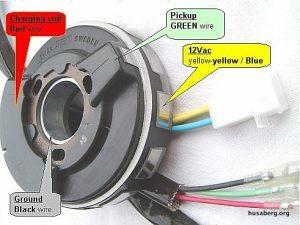 Make sure the black to green measures 23 Ohms as some of the last models measured 165 Ohms. 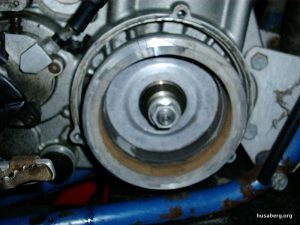 Anything from 1999 to 2003 will have to be from Husaberg, as the SEM stator for these years was a one off and wasn’t fitted to anything else. The Stator will continue to work minus the wrapper. 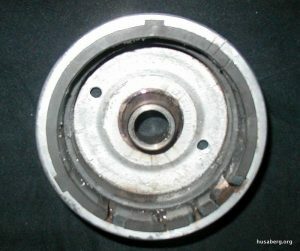 For many years I had both stator and flywheel cryogenically treated. Said treatment improved low rpm spark output via a reduction in fine wire resistance. Unfortunately the “deep freeze” caused severe cracking making the end user a bit uncomfortable (Lineaweaver). Some motorcycles come with this rare combo for Supermoto with a SEM, and here is one with problems.